Ready to hit the boardwalk while the surf’s flat and pump your way through the summer throngs? Perhaps you’re more interested in blazing downhill, or carving your way across a descent. Whatever your preferred passion, you’re going to need the right longboard to do it. We’ve assembled a list of the best longboards for 2019 to make that process simpler. Ready to go? Let’s hit it. Of course, you need a bit more information about each board in order to decide which is the best longboard of 2019 for your particular needs. Let’s dig a bit deeper into each board and see what’s on offer. 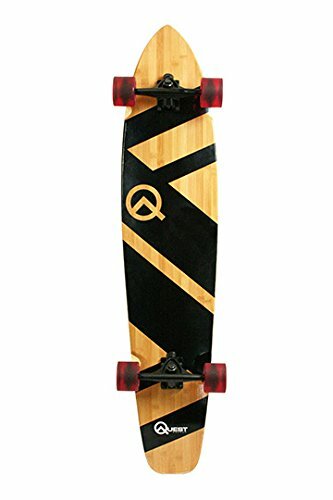 The Quest Super Cruiser is the longest longboard on our list, cheap longboard, and one of the most exciting. It’s one of the best options for anyone looking to cruiser around town, on the boardwalk or down hills. It is made with bamboo and maple, offering outstanding performance and durability, without the heft that can sometimes come with all-wood construction. The slight kicktail gives this board a bit more maneuverability than other longboards, and it features ABEC 7 speed bearings for excellent downhill performance. It also features seven-inch trucks (aluminum) and is made in the US. Measuring just over 41 inches in length, the Sector 9 Bamboo Lookout is a stunning longboard. It features the popular cutout style (also called drop-through), and uses bamboo and maple construction to ensure durability and quality, while reducing the weight of the board. It’s also made with performance in mind, and features 10-inch Gullwing Charger trucks, with ABEC 5 speed bearings and 74 mm wheels. The drop-through design allows the deck of the board to enjoy a lower center of gravity, without the need for a dropdown deck design. The use of bamboo not only lightens the board, but also helps to dampen some of the flex, allowing control and stability. The Atom Drop Through 40 features a full 40-inch deck, and a cutout design. Drop-through trucks ensure a lower center of gravity for better control, and the ultra-wide wheels provide plenty of contact with your riding surface. Note that this board features ABEC 9 speed bearings for excellent speed on downhill courses. The deck is made of laminated bamboo and maple, delivering good control, and a lighter weight than might be expected with wood boards. 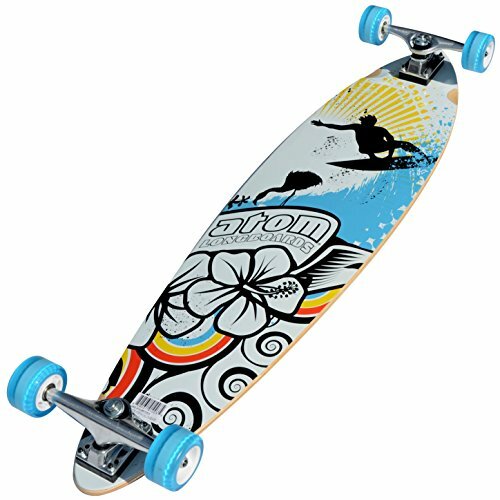 This board also features Navigator Drone trucks, with 180 mm hangers and a 4-degree base, and the wheels are 51 mm in width. The deck is coated in court 46-grit grip tape, too, so you never need to worry about losing your footing. The YOACAHER Professional Speed is a stunning addition to our list of the best longboards for 2019. The only dropdown board to make our list, YOCAHER’s offering delivers 41 inches of performance. The board features HD7 heavy duty trucks with 180 mm hangers, as well as 52 mm wide wheels (70 mm in diameter). The deck is completely made from maple (9-ply for strength and durability), and there is limited flex in the body itself. The dropdown design not only reduces the center of gravity, but helps you get the most out of pumping. One of the most popular styles on our list of the best longboards for 2019, the pintail offers classic good looks and excellent performance. The Atom Pintail longboard measures 39 inches, making it one of the shortest on our list, but also one of the most easily controllable. It also features 8.5 inch aluminum trucks, and ABEC 5 speed bearings. 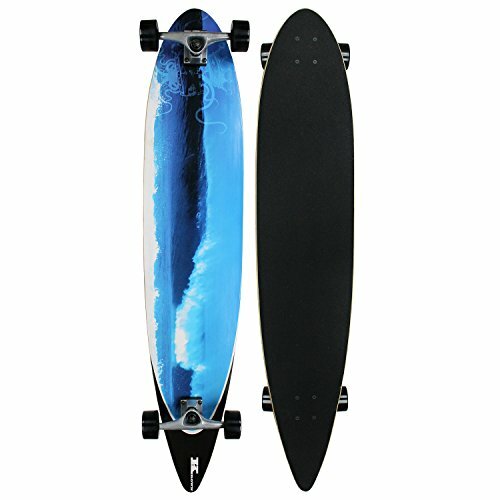 The pintail shape helps to avoid wheel bite while pumping or carving, and the deck is made from maple laminate to ensure optimum weight, but also excellent durability. Note the deck is fully covered in grip tape for secure footing while riding. The Santa Cruz Lion God Rasta longboard is beautifully designed, but also rides very well. The cutout design (drop through) ensures no wheel to deck contact, and the 9-ply maple construction offers excellent strength and durability. Note that this is not a dropdown board. It’s designed to perform well as a cruiser, or for free riding/freestyle riders. It features OJ Thunder Juice wheels that measure 75 mm, and the board features Road Rider trucks with 180 mm hangers. Note that this longboard comes fully assembled and ready to ride out of the box. 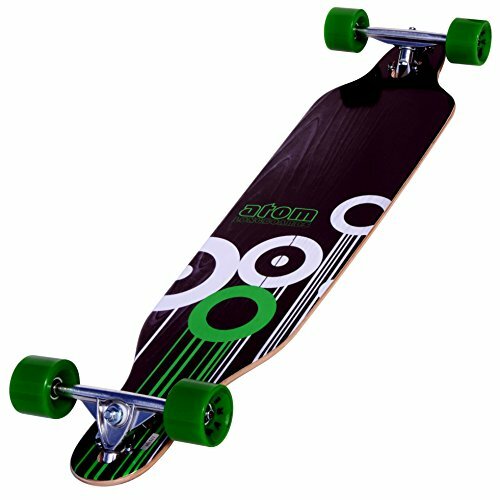 The Atom Drop Through 41 measures a full 41 inches in length, and features the cutout deck style necessary to prevent wheel to deck contact while pumping, but also provides 9.6 inches of leverage with each turn. The board is made from maple for durability and resilience, and features reverse kingpin trucks with 245 mm axles. Note that the use of reverse kingpin trucks gives this board a lower center of gravity than many others, providing greater stability. This board is designed for cruising, although it will perform well in carving and other applications. Another pintail longboard, the Krown Complete is made from 100% Canadian maple for a lightweight, yet durable board. It measures a full 43 inches in length, and is one of the longest on our list of the best longboards for 2019. It features six-inch trucks with 65 mm wheels (78A) and ABEC 7 speed bearings. Note that this board is assembled in the Krown shop by professional riders, and there is no assembly required when it arrives. The entire deck is covered in coarse grit grip tape to ensure good footing in all riding conditions. 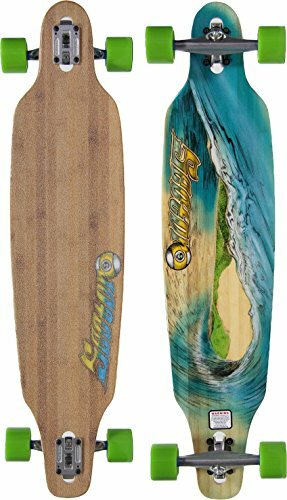 Measuring just over 43 inches, the Santa Cruz Mahaka Rasta is one of the longer boards on our list, which means better speed and less time kicking off. It features 100% North American maple construction for durability and performance, and is designed to be one of the best cruisers on the market. With that being said, it will perform equally well as a carver. 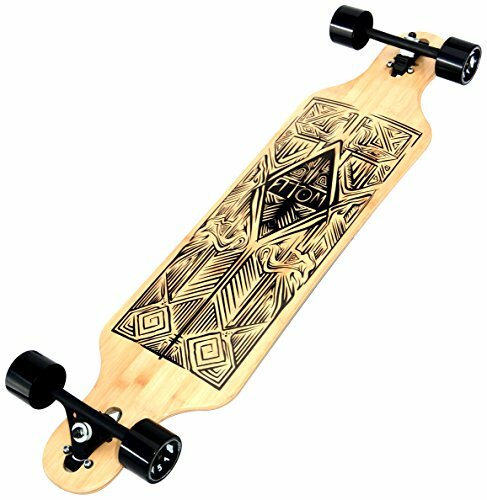 Note that this board comes with Bullet B150 Back Cutback Trucks, as well as Bullet ABEC 3 bearings (ideal for beginners and those who simply want to cruise, rather than take on downhill runs). 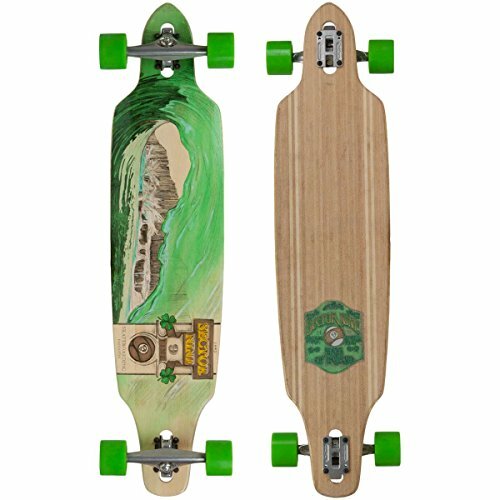 Our final longboard is the Sector 9 Lookout. Similar to Sector 9’s other entry on our list, this board features bamboo construction (five-ply), as well as top-shelf wheels mated to AEC 5 bearings. These offer something of the best of both worlds in terms of speed and control. The trucks measure a full 10 inches for excellent pumping capability, and the cutout deck style prevents unwanted wheel to deck contact. The wheels measure 74 mm (78A), and the board itself measures 42 inches in length for good control while cruising or in freestyle riding. Longboards share a lot of their DNA with other types of skateboards out there, but they’re unique in and of themselves, as well. Originally, they were used by 1950s and 60s Hawaiian surfers to ride the sidewalks when the waves weren’t cooperative. The goal was to replicate the surfing experience on dry land. Today, they serve as a means of transportation, a vital tool for an exciting sport, and are surrounded by a unique culture. If you’re interested in taking on long, downhill runs, cruising around town, or carving your own path, you’ll find a longboard out there that helps you do it. 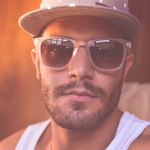 Of course, you’ll need to know a few things about longboards themselves, as well as the styles of riding that work best with these unique boards, in order to make an informed choice. Longboards and shortboards might both be types of skateboards, but they’re about as different as you can get. Shortboards come in a variety of lengths and styles, but they are overall short and compact. They’re designed for portability, for tricks and stunts, and the like. Longboards are more laidback. They’re longer and wider, offering much better purchase for riders, and they’re less well-suited for tricks. Learning how to ride a longboard is also easier than a shortboard. With that being said, longboards have no specific length limitations. They can be shorter or longer, but they tend to be longer than the longest shortboards. If a board is over 91 centimeters, it is generally considered a longboard, regardless of what the manufacturer might have designated it. Longboards are often as long as 130 centimeters, and can often be longer. Another difference other than sheer size is the means of locomotion. 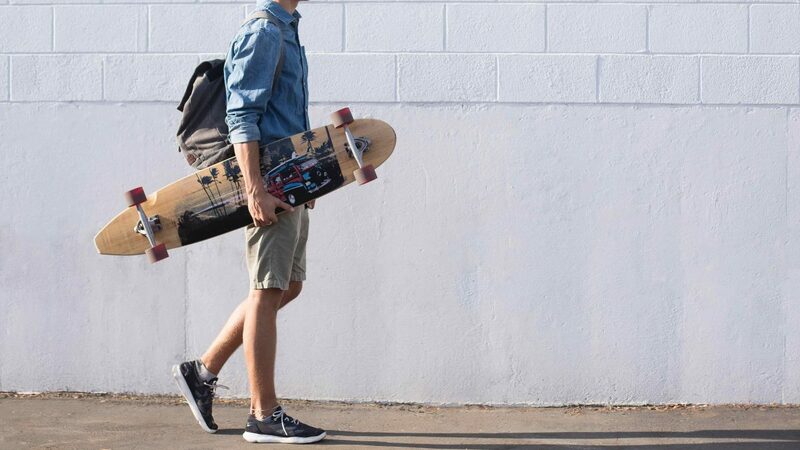 Yes, both long and shortboards are powered by your feet and legs, and you’ll need to kick off with a long board just like with a shortboard. However, on long, flat or downhill sections, longboard riders can “pump” their way forward. That is, due to the length and width of the board, riders are able to keep both feet on the deck and shift their weight back and forth. That creates forward thrust, which can allow you to keep moving forward indefinitely without the need to kick off again. Riders will find that longboards offer a number of tradeoffs, particularly in comparison with shortboards. They’re longer, wider and much more stable, obviously. However, they’re also slower and less agile due to their greater length and weight. They’re not particularly ideal for use at skate parks – you’re more likely to find these being used out in the wild for transportation or fun, or in professional competitions, than you are within a park designed for tricks. With all that being said, it’s important to realize that there are many different types of longboards out there, each designed with specific benefits and uses in mind. We’ll take a look at the types of longboards in the next section. 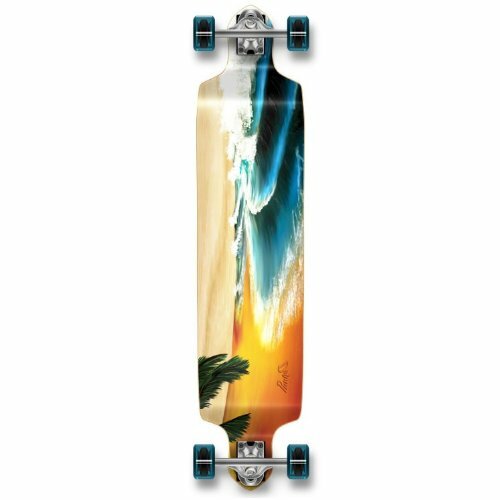 Like shortboards, longboards are available in a wide range of different types and styles. These are tied at least in part to the riding styles of different riders, but there are other benefits to the various board styles on the market today. Blunt: Featuring a blunter nose than other longboard styles, this type is closer to a conventional shortboard, but are often equipped with taller trucks and larger wheels to make up for the reduced wheel clearance due to the presence of decking over the wheels. Dropdown: The name of this style really says it all. The center of the deck is dropped in relation to the portions over the trucks. This allows a shorter travel distance when pumping, reducing strain on the rider’s legs. Most boards of this style have cutouts around the wheels to improve clearance when pumping. Speedboards: Again, the name holds the key to the purpose of this board style. Speedboards are, you guessed it, designed for faster riding (relatively speaking, of course). They offer excellent stability and can accelerate more than most other board styles thanks to their reduced flexibility and large wheels. Note that the body is similar to a blunt board. 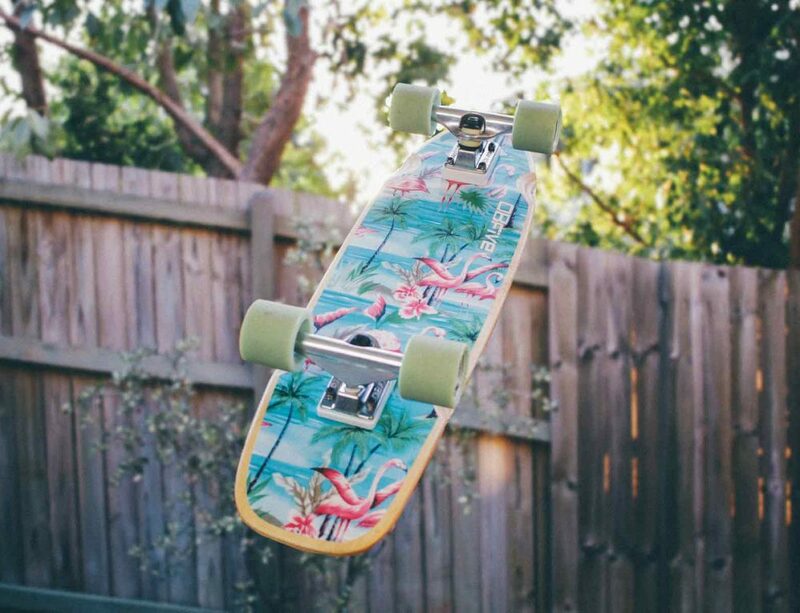 Pintail: Most often associated with cruising, pintail longboards look a lot like surfboards at first glance, with tapered ends and larger than average wheels. They’re excellent all-around boards, but can also be good for carving. Fishtail: A little shorter than the average pintail, the fishtail is a good cruiser board. They make excellent options for transportation, as their slightly shorter body is easier to carry on and off buses and the like. Cutouts: Cutouts feature sections of the deck removed from above the wheels, similar to a dropdown board. However, they’re designed without a defined back or front, and can be ridden either way, and are good options for downhill riding, as well as in freestyle riding. Twin Boards: One of the only styles of longboard that can be used at a skate park, twin boards are slightly heavier and longer than shortboards. They’re good for stability, but because of their smaller size, they’re a bit more difficult to ride than other styles. Each of the longboard styles above ties into one of five types of longboard riding, delivering capabilities that help riders achieve the style and performance level they want. In the next section, we’ll explore longboard riding styles and what each involves. Like shortboards, bikes and pretty much every other method of transportation that is also used for pleasure, you’ll find a number of riding styles for longboards. Cruising: This is perhaps the most obvious style of all, as it’s really not a style per se. Rather, it’s a pastime itself, similar to cruiser bikes. Those who use longboards for cruising appreciate stability and easy rolling, as well as good balance. Boards designed with cruising in mind usually have softer wheels, and often feature more flexible decks for easier pumping. Carving: Carving is similar to cruising, but generally involves some gradual downhill slopes. Think of riding a snowboard, where the rider does not go straight down the hill, but cuts S-shapes into the snow instead. The concept is the same with carving. Softer wheels, responsive trucks, and good deck flexibility are important here. Downhill: Downhill longboarding is fast – very! Riders can get up to 50 miles per hour or more, all while handling straightaways, curves, bumps, dips and more. A board made for downhill riding will have a lower center of gravity (shorter trucks, or a dropdown deck), and less flexibility than a cruiser. Drifting: Drifting is part of both cruising and downhill riding, and it’s very similar to the action of the same name in auto racing. The rear wheels break traction and slide across the pavement in time with the body, allowing the boarder to skim around turns. Drifting requires wheels that can be broken out easily, and a board with less flex. Freestyle: Freestyle, or free riding, is nothing more than adding a few tricks to cruising or carving. A shorter board is often best for this, but longer boards can also work well. The necessary board characteristics will vary depending on the tricks you want to perform. Now that we’ve covered some of the board types out there, as well as the various riding styles possible with longboards, it’s time to touch on what you need to consider before buying your own longboard. In some cases, you’ll want to buy a board already made, but in others, you might find that buying individual components and assembling your longboard on your own is the better option. Below, we’ll cover a list of what you need to think about before buying a longboard, whether you’re buying prebuilt, or looking to customize something on your own. Riding Style Preference: Obviously, your preferred riding style is going to have a huge impact on every aspect of the board you buy. That applies to everything from the shape of the deck to the softness or hardness of the wheels. So, before buying anything, know how you want to use your board. Deck Material: You’ll find a very wide range of deck materials out there. Some low and medium-range boards use thick plastic. Others might use wood like maple or birch, or even bamboo. Carbon fiber is a more exotic material. Wood is the heaviest and carbon fiber is the lightest, and you’ll find that wood is more frequently used on boards where speed isn’t the main factor (cruisers, for instance). The lighter the material, the better suited it is for speed (and the higher the cost, usually). Deck Flex: The amount of flex in a deck is a very important consideration and will tie into the type of riding that you do. If you’re carving, you will want a lot more flex than if you were interested in downhill racing where straight line performance and speed are the most important factors. The greater the flex, the more control in turns you have, but also the better you’ll be able to pump the board along. Overall Length: Length is important for control. The shorter the board, the more control you have over it. Shorter boards are also easier to do tricks with. However, longer boards are faster, more stable and offer better balance. Kicktail/No Kicktail: A kicktail is nothing more than a raised tail section of the board, similar to that of a shortboard. Some longboard styles have no tail (cutouts, for instance). Having a kicktail means that you’ll have an easier time controlling the board, and a better chance of doing tricks. Not having a kicktail makes a board more stable. Wheels: Longboard wheels can be up to 107 mm in diameter, in contrast to shortboard wheels, which max out around 60 mm. The larger diameter means they can hit higher speeds. You’ll need to choose the right lip shape (round for better tricks, or square for better stability), as well as the right width (wider for better cruising and narrower for higher speeds). Finally, make sure to choose the right durometer (hardness) for your riding style. A indicates a softer wheel and B indicates a harder wheel. 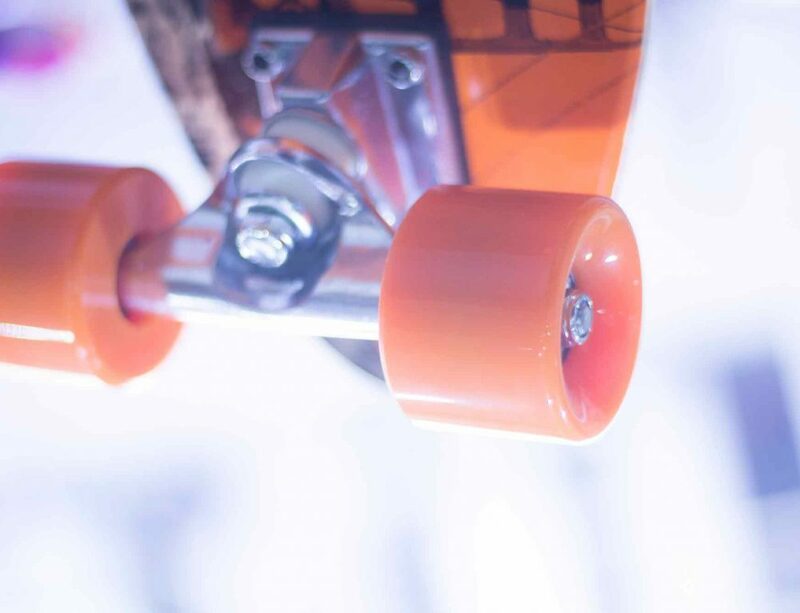 Bushings and Trucks: Trucks are the pieces that connect the wheels to the deck of your longboard. They matter for a number of reasons, including the kingpin used, which affects flexibility and handling, and the bushings used, which affect control. Harder bushings reduce turning ability, while softer ones allow more control. Kingpins are used to adjust the compression of the bushings, modifying the ride quality and control you have. Bearings: Without bearings, your wheels won’t turn. However, you’ll find a range of options in terms of bearings for your board. Each bearing has an ABEC rating. The higher the rating, the faster the bearings will spin and the higher your ultimate speed will be. There you have them – some of the best longboards for 2019. By this point, you should not only have a good idea of what the best longboards of 2019 are thanks to our handy rating in the beginning, but you should be well positioned to find the right board for yourself, even if that means building one from loose pieces.